Steketee Trophy Awarded to Pontiac Yacht Club - Fleet 54! The Executive Committee is excited to announce that Michigan District, Fleet 54 - Pontiac Yacht Club is the 2018 recipient of the Steketee Trophy. The Steketee Trophy is awarded to a North American Fleet who is outstanding in furthering the purpose of the ILCA in promoting and developing racing. Fleet 54 put forth an extraordinary team effort in hosting the LARGEST Women's, Junior and Masters' North American Championships to date. Their dedication and support of the Class is genuine and from the heart. They re-emphasized that the Class is about family, friends and a shared passion for Lightning sailing. Visitors from the Lightning Class were made to feel welcome and the hospitality was second to none. We like to think of the ILCA as a family and we were treated as such by Pontiac Yacht Club. Sitting under a shade tree during postponement watching the kids play water volleyball and soaking in all the other activity made me smile. Making the event free for juniors and even more importantly, fun for juniors, really shows PYC's commitment to the future of sailing. The club captured the essence of the event and was the perfect host. I have never in 61 years of sailing seen a regatta like this one. The 2 days of racing bookended a spontaneous day long multi-generational party above and beyond anything I have ever experienced. “What about the sailing?, they asked”.... “Sailing?” I replied, “Why would we do that! There’s no wind and we’re having too much fun for sailing. This is the best regatta ever!!”. 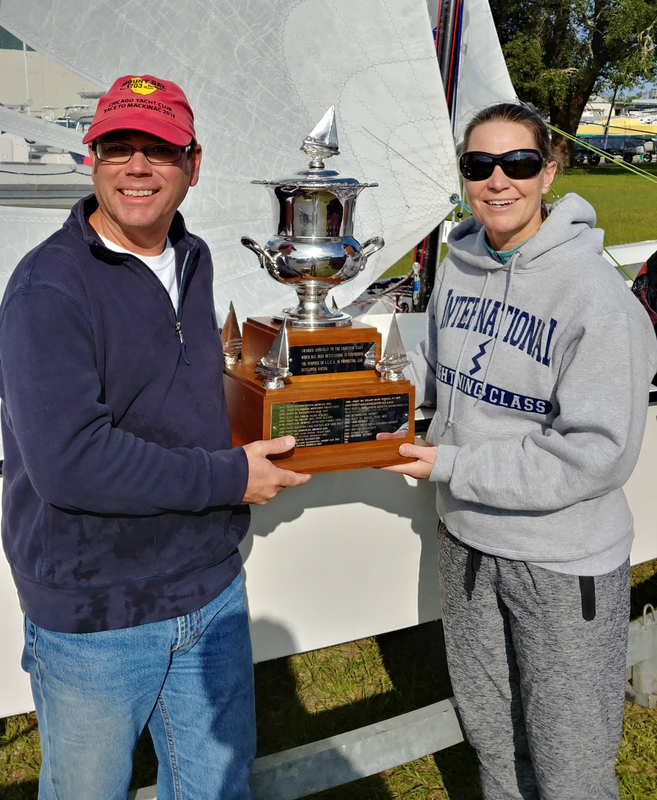 Photo Left - Mark Allen, Fleet 54 - Fleet Captain accepting the Steketee Trophy from Class Secretary, Laura Jeffers. Full history and past recipients of the Steketee Trophy. Video Recap of the 2018 WJM's at Pontiac Yacht Club.